Here are some of the more mathematical concepts related to Multisense Realism. Mathematics does not exist on its own. It does not haunt the vacuum of space. It does not manifest as public objects or substances. It has no will or motivation. 1) A private experience of imagined sensory symbol-figures which accompany a motive of quantitative reasoning. 2) A collection of public objects interacting in a logical, causal way, without any private representations, as a consequence of the shapes of multiple rigid bodies. The problem with functionalist expectations is that they seduce us into a shell game so that when we look at math ‘out there’ (2), we smuggle in the meaning from ‘in here’ (1), and when we look at meaning in here (1) we mis-attribute it to the blind enactment of material bodies. We assume that the world outside of our minds runs on math not because it actually does, but because our awareness of the public arena is a grossly reduced, indirect logical construction. The universe without, like the universe within, runs on qualitative sensory-motor experiences. Turning the functionalist expectations around then, we find that the activity of the brain is not the source of human experience, but rather the effect of many kinds of experience on many levels (physical, chemical, biological). These experiences are not generated by information or mathematics, but rather information is an analysis of experiences by someone who knows almost nothing about them first hand. We are used to thinking of ‘data’ in terms of digital vs analog. Consider however that both of these categories are a-signifying formats. I would like to propose a principle by which subjective, signifying experience is introduced – a qualitative instrumentality of being. 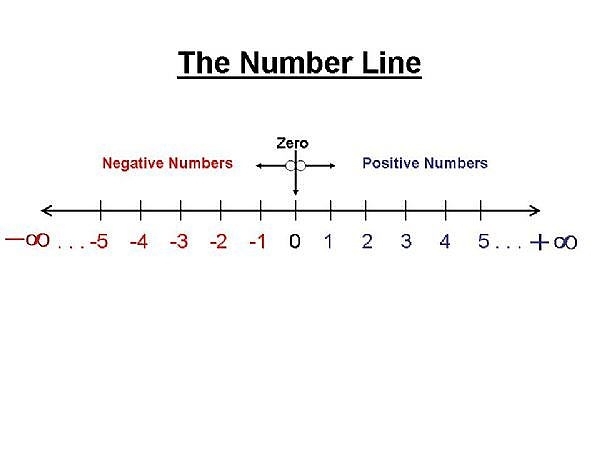 Think of the number line – abstract, linear, literal. A conception of pure quantitative non-awareness. It’s a semantic artifact from which all qualitative content has been stripped. It’s like a Supremetist work of art, really. The act of measurement itself is to invert qualitative experience – to collapse it into value coordinates on a numberline, allowing us to treat it as a hypothetical object, aka, a figure. Ordinal position applies to the literal, outward facing specifications of rank. This is where the universe gets the ideas for front and back (anterior and posterior) and interior exterior. As in Chess, rank refers to the relative power of the piece – the order of their significance to the game. Ordinal disposition applies to the figurative, inward facing qualities associated with rank. This is where the universe gets the ideas for best and worst (superior and inferior). Feeling like a King or Queen, being treated like royalty, having access to first choice in dividing the spoils, etc. Ordinal disposition is about the experiential privilege of rank while ordinal position is about the mechanics associated with delivering or deriving that privilege. by contrast, Cardinal position I am saying refers to the relative size of a real public phenomenon. The range here is along an axis from the micro to the mega, and can refer to increasing scopes and scale or increasing quantitative complexity. This is about structures nested within structures, separated by spaces of varying size. Rather than in/out, front/back, or high/low-superior/inferior, cardinal position is about spatial-topological extension – long/short, large/small. Cardinal disposition rounds out the four as an evaluation based on rarity. Like the pawns in chess, their generic abundance relative to the two unique pieces and the three duplicated pieces indicates their disposable rank. This is different from ordinal disposition in that superiority/inferiority derives not from order in a sequence, but from degree of commonality. Where cardinal position is about space and geometry, cardinal disposition is about feelings derived from time and algebra; frequency. How often. Sooner/later. Cheap/dear. Ordinary/exotic. The magic here is in pattern recognition. ‘Three in a row’ is an example of how low caste occurrences can ascend to uncommon value. The terms for the columns and rows in chess, rank and file, are useful here. The rank can be seen as the vertical axis of qualitative position and disposition, while the single-file of pawns exemplifies the horizontal axis of quantitative position and disposition. Poker hands are a good metaphor to see this as well. Pairs, three and four of a kind, flushes display cardinal significance, straights, high cards, and Royal flushes display ordinal significance. The other hands, full house, straight flush, demonstrate an appreciation of the cardinal disposition of combined cardinal and ordinal values. In the lower yellow half, the subjective experience of ‘now’ (M1) represents the tip of an iceberg of mental events (M) through constraints on experiential scope . The scope of a human experience is limited on the ‘near’ end by sampling rate and on the ‘far’ end by long term memory. The event horizon of the M1 now degenerates from proprietary availability toward Mφ (totality of experience, significance, or consciousness itself) along a proposed fractional Fibonacci ratio. The blue upper half, by contrast, depicts the counterpart to M1 as ΣP, or the sum of all physical presentations relative to any given M stack. Note that physical presentations (P) are understood to be the ‘back end’ of mental presentations (M), i.e. a better symbol for physical presentations here might be shaped like a W to mirror M.
In the blue half of the diagram, the fading nested ellipses represent a different, public kind of constraint on sense – obstruction and scale. Beginning from the outside at P1 (the Big Bang) and proliferating into smaller and more granular forms. The spread between the cosmic and the microcosmic pushes out from the middle. Degree of figurativeness in qualia equates to privacy of qualia. 1. Subjects necessarily have access to more qualia which applies to their autobiographical experience than qualia which refers to external, publicly accessible experience. 2. It is proposed that the more strictly personal a quale is, the greater the set of interconnected psychological associations that exists for the individual and the richer and more imaginative those associations can be. 3. Mathematically, the more personal an experience is to us, the more ways we can shift its meaning, making qualitative floridity and associative fluidity directly proportional to privacy. Loschmidt’s Paradox, which as I understand it is basically “If the universe is always increasing from low entropy to high entropy, then where did the initial low entropy come from?” can be approached in a different way than what has been suggested so far. Boltzmann’s entropy curve proposes that our universe’s Big Bang is only one of many bubbles or waves which we find ourselves in anthropically. What I propose instead is a single well of bottomless low entropy, which perpetually lengthens as all possible Boltzmann entropy waves are anticipated and absorbed before they can threaten the negentropic monopoly of the well. In this view, the range of possible kinds of signals becomes quantitatively bound on one extreme by the Absolute (where all signals are fused in singularity of significance) and spacetime (where all signals are divided in absolute cardinality or insignificance). Like velocity, which ranges from stillness to c, the phenomenon of significance actually defines the parameters of its own measure. 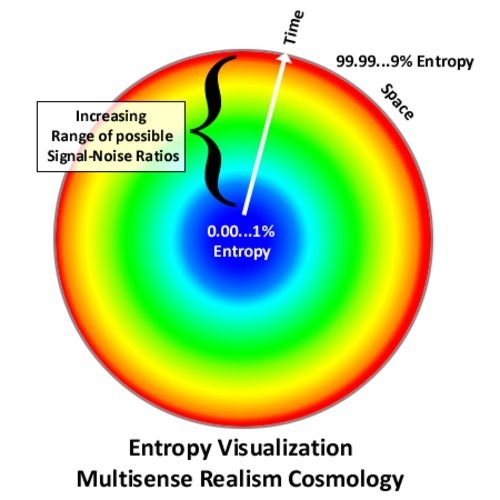 Entropy has meaning only in relation to expected significance, such that anything less than 100% entropy has some portion of Absolute significance. The most insignificant event can still only have 99.999…% entropy, and even the negentropic monopoly of the Absolute can only ever attain 0.000…1% entropy. This way, the Big Bang becomes a perpetually receding event horizon of absolute and eternal negentropy, – a Borg-like ‘bright whole’ which tyrannically absorbs and subordinates all potentials and possibilities into a single continuum-schema of sense. This continuum must accommodate all paradoxes which amounts to a lot of fancy devices like nesting signals within each other on multiple interrelated layers or castes, and orthomodular juxtapositions such as private-public. These devices accomplish what I call the Big Diffraction. The initial signal, which is the bootstrap for all sense-motor phenomena, is initiation itself, and as it defines all future coherence, it is perpetually hogging all possible signals for all time, banishing any rival Multiverse by perpetual deferment and delay. Ah, yes, this whole perpetual austerity/race to the bottom thing really can’t be criticized enough. It helps me to see it in the context of this pendulum swing of human evolution since the Enlightenment toward the limit of Western over-signification of mechanism, but it is hard to believe that we are really going to keep doing this until the wheels fall off. ha! – and then we’d have to invent the wheel all over again! I love, LOVE this entropy analysis of the objective/subjective (I’d love a whole post on entropy sometime.) but am a little confused. If the big bang represented private experience in its richest, lowest entropy significance state why does sense seem to grow as the Big Bang recedes ever farther into the past. We seem to be reducing entropy in the evolution of consciousness, not growing it. The first experience is a bootstrapping of experience itself. By this I mean that the first signal (which would be a low entropy event) is the opening of the grand circuit of all future sensations and sensitivities which is the Big Bang. This frame of sense or presence (and it isn’t an abstraction, it has an aesthetic theme of solitude, solace, wholeness, healing, home, etc…Heaven in the Ch’ien hexagram sense) stays the same on its own essential level but constantly grows on its expanding existential-spatial levels. The BB recedes into the past only from the perspective of a participant within it, but on its own absolute level of the outermost frame/innermost hub, every point on the expanding wheel is eternally available (although maybe in an iconic form rather than a realized form…realization is like the shadow of the Absolute). It’s hard for me to conceptualize still, but I think someone more mathematically talented could do it. The low entropy meta-signal of the Absolute opens the universal diffraction (Tsimtsum) which is the absolute high-entropy resource. Signals accumulate ever richer significance which pushes the entropy of the Absolute ever lower and its significance ever higher. The Absolute becomes more and more filled with grandeur and empty of uncertainty, but the emptiness is a floating floor, there is a conservation of entropy so that it is forever falling but never reaching absolute zero…which means that on the absolute scale, entropy is never decreasing at all. Our human lives are microcosms of this. The self becomes more grand in one sense, accumulating layers of character through experience but suffering more from the weight of its own negentropic confinement by history in another sense. Likewise each experience gives us more insight into what is possible and who we are, which actually increases the entropy, gives us more freedom potentially, although usually with less opportunity to use it. This is something like what Milan Kundera meant by the Unbearable Lightness of Being – that Earth is the planet of inexperience, with each position we find ourselves in being fraught with only two unacceptable possibilities – life as eternal (and therefore meaningless) exercise, and life as unrepeatable (and therefore tragic and meaningless). The Absolute would redeem this unbearable lightness, as it is both eternal and unrepeatable…a single unrepeatable meta-signal of possibility for expanding freedoms and deepening aesthetics…by means of modulating partial constraint on that signal. Let’s see if I can simplify that. The Big Bang is not an event in time. It is still happening. It is like a clock which takes an eternity to tick even once. It would be misleading to think of it then as that which ‘represented’ private experience in it’s richest (lowest entropy, highest significance) state, but rather that it is the living presentation of experience in it’s richest state, and the state in which all publicity is dissolved. The appearance of the public is the same thing as the appearance of the private – it’s an inference. We see the world and the world is not us. In the frame of the Absolute, there is nothing which is not us, so there is no public-private split…but the experience should be more like what we know as private experience, because that is the ‘head’ end of the snake and the public ‘tail’ end is the tokenized, quantified re-presentation. It could be said that we are reducing entropy in the evolution of consciousness – turning private feeling and being into public doing and knowing, but at the same time the possibility of collapse is conserved. The threats and uncertainties simply become more esoteric. Rather than having to wrestle resources from the environment directly, we now have to wrestle abstract financial resources from our own abstract systems of control. We are creating new entropies of the complexity of our interaction, which is mirrored publicly as the thermodynamic entropy being exported by human colonies in the biosphere.